Many parts of Britain have been battered with snow this winter, but with spring on the horizon, you’d be forgiven for thinking the worst of winter is behind us. Unfortunately, you’d be wrong and UK drivers in some spots are being warned they could expect further motoring misery. The Met Office has issued weather warnings of sub-zero temperatures and snow suggesting travel will be a misery this week. That is expected to be especially so for those in the UK’s eastern and northern counties with the severe weather set to spread to most parts in the latter half of the week. 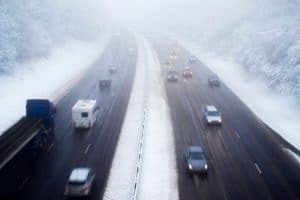 In a bid to keep Britain’s motorists moving, the AA is mobilising extra resources in case there is increase demand from stranded drivers over the coming week. The motoring authority is also warning drivers to take extra care and to follow the advice of the emergency services, especially in areas where driving should only be attempted if absolutely necessary. Vince Crane, who is the AA’s patrol of the year, said a well-maintained car should be able to handle the cold, but sub-zero temperatures always spark a considerable rise in the number of cars that won’t start, thanks to tired batteries. He revealed that electrical and tyre problems are the top two reasons for AA call-outs and that is especially so in harsh winter weather. “If it’s snowing hard, that makes dealing with breakdowns difficult because AA patrols are likely to be caught in the same hold-ups,” said Mr Crane. There are several things motorists can do to avoid having to call the AA, such as keeping engine fluids topped-up and bringing along the essentials like extra clothing, drinks and a mobile phone in case you get stranded. Planning your route carefully and driving smoothly leaving plenty of distance from the car in front are also tried and tested tips.